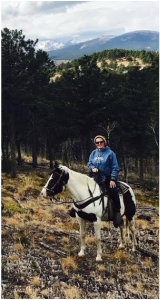 Kathleen joined QEVS in 2009, working as a veterinary assistant and bookkeeper. .
Having spent the last 20 years ranching in the Rocky Mountains, Kathleen has experience in a variety of animals including; horses, goats and alpacas. In her spare time, Kathleen enjoys friends, family and the mountains. She also is quite the Irish scholar, and studies Celtic languages.